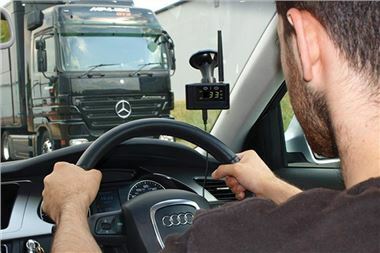 Tyresure, a manufacturer of Tyre Pressure Monitoring Systems (TPMS) has launched a dedicated system created specifically for the leisure and towing market. EU legislation has dictated that all passenger cars must have TPMS fitted from the factory as a legal requirement from 2012. Although this hasn’t yet been rolled out as a mandatory fitment in the leisure market. Many industry experts feel that it is only a matter of time before safety-conscious manufacturers start including this in the options list, at least. This compact kit has been designed from the outset to be a true ‘plug and play’ fitment, with all of the technology being very user-friendly. The exceptionally clear LED dash display simply plugs into the car’s cigarette lighter to provide all salient information to the driver, live and in real-time. This can be mounted directly to the dash, or if preferred, via a sat-nav style sucker-cup pedestal. The sensors themselves fit directly into each of the trailer or caravan wheels as a replacement for the standard valves and will flag up onto the dash display if there is more than a 20% pressure parameter change. Temperature can also be displayed to allow accurate monitoring throughout the journey. The Tyresure system is very clever. Each sensor comes complete with a matching ID module. Once each sensor has been fitted to the appropriate wheel. The ID module is simply clips into that position in the dash display and starts to read. For example, fit sensor one into the right rear trailer wheel and simply clip its ID module into the ‘right rear’ socket of the dash display. It will immediately read accurately and consistently. If the trailer wheels need to be rotated or changed, simply move the ID modules round to their new positions and the dash display will be instantly updated. This takes seconds to achieve. If the Tyresure-equipped trailer or caravan suddenly needs to be towed by a different vehicle, the dash display can also be transferred in seconds, just like a sat-nav unit, making it perfect for commercial or recovery applications. The units are very durable, being able to operate under temperature extremes from -20°C right up to +70°C. The pressure range on the standard kit is also able to cope with a wide range of readings, from 26 Psi up to 67PSI, or if required, a higher-banded model is available which covers all readings between 43.5 and 145 PSI. This unit is perfect for RVs and highly-rated trailer units, many of which have cold pressures of around 80 PSI. In all case, the sensors have a continuous battery life of around 7 years, once activated, and will remain accurate to within +/- 4 PSI and +/- 3°C when being used between 0°C and 50°C. There are many reasons to fit a Tyresure system to your trailer, caravan or RV. Not only do correctly inflated tyres return far greater fuel economy than their under-inflated counterparts, but the safety benefits speak for themselves.